Well Thanksgiving is over and the weather has gotten cold here in North East Ohio. 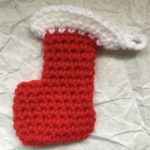 With the winter holidays a couple of weeks away and more craft shows ahead I thought I would share with you a new crochet pattern I designed. 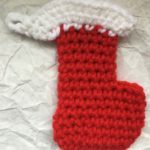 I created and designed the Mini Stocking Ornament crochet pattern. 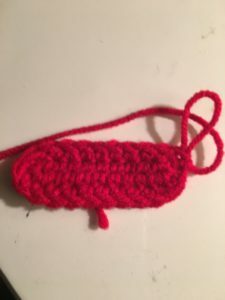 I looked for some patterns on Pinterest, but I didn’t find quite what I was looking for, so I got out some yarn and worked at it until I got it just right. 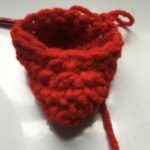 If you would like to download an Ad Free PDF version of the pattern that you can keep and use again and again, you can purchase it for $1.50 from my Ravelry Store here. 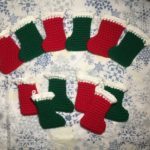 I decided to add some step by step pictures to go along with the mini stocking ornament crochet pattern. So let’s get started. SC2TOG instructions on YouTube here. In this pattern you will be going around the chain, in the top and bottom part of the chain. If you need help here are some instructions from YouTube. SC2TOG instructions from YouTube here. 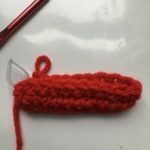 RSC = Reverse Single Crochet instructions from YouTube here. At the end of each Round there won’t be a Join. This is where the Stitch Marker will come in handy. Red is the MC and White is CC. 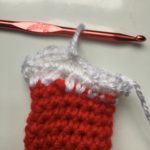 On Round 16 there are 3 options on how to finish the top of the stocking. Try them all and see which one you prefer. You will be going around the chain. At the end of Round 14 ss in the 1st sc made of Round 14 and join. Fasten Off and change color. Option 2 for R16: ch 1, reverse sc in the same stitch and each st around. 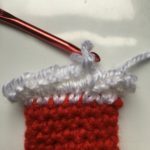 (16 rsc) As you can see my pattern testers LOVED the Reverse Single Crochet! Option 3 for R16: Turn, ch 1, sc 2 times in the same st and in each stitch around. (32 sc) ss in 1st st to join. R17: Turn, ch 1, sc in the same st and in each st around. (32 sc) Ss in 1st st to join. Fasten off. These 2 rounds created a cuff that you can fold down, if you prefer. 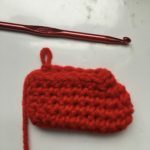 Here you will be making your “Loop” that you use to attach the ornament to the tree or whatever you will be hanging it from. 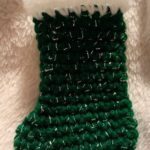 I chained 5 which makes a small “Loop” for me to attach the mini stocking ornament to my tree but you can chain as many as you like. After you join on Round 16 ch 1, sc in same st, ch 5, and sc in same st.
Fasten off and weave in loose ends with Tapestry Needle. Congratulations! 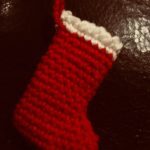 You now have a 4 inch Mini Stocking Ornament. 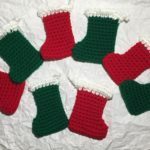 There are SO many things you can do with these mini stocking ornaments! 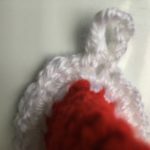 You can crochet more and hang them from your tree. 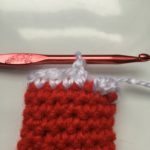 You can crochet more and connect them creating a garland. 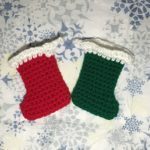 You can crochet more and use them to hold tiny gifts for your loved ones! You can give them as a gift! The list goes on and on! 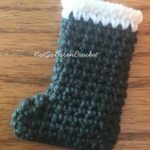 Thank you for trying my Mini Stocking Ornament Crochet Pattern! 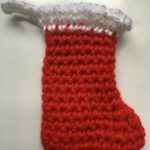 I would LOVE to see what you have used the Mini Stocking Ornament Crochet Pattern for! 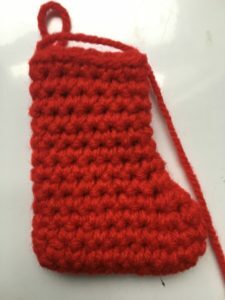 Please post pics, leave comments, or even suggestions about the Mini Stocking Ornament Crochet Pattern. You can also find me on my Facebook Page Jo’s Crafty Hook Designs and share with me there as well! Merry Christmas, Happy Hanukkah, Happy Kwanzaa, or what ever Holiday you celebrate! 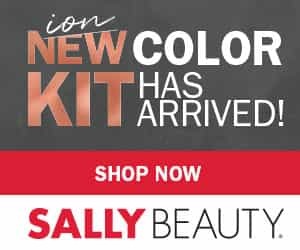 Be sure to join my Mailing List and sign up for my Newsletter, I have many great things I want to share with you in the next month and upcoming year 2019! 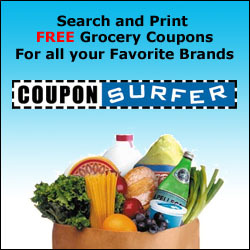 While you are at my website be sure to subscribe to my Mailing List and Newsletter. 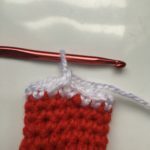 This way you will be notified when I release another crochet pattern or blog post and be alerted to Sales, Coupons, and more! 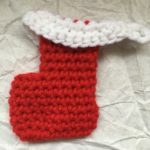 If you have any questions or concerns about the Mini Stocking Ornament Crochet Pattern or any other pattern please email me at jo@joscraftyhook.com. 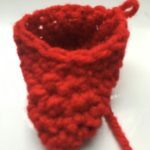 You will find my other crochet patterns here at my website. 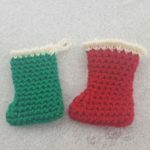 I just posted a couple of my new crochet pattern designs. 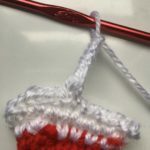 They are the Tulip Sweater Vest Crochet Pattern and the Sharon Bag Crochet Patterns! 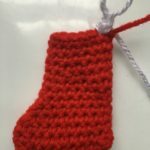 You are free to sell or gift the Mini Stocking Ornaments you make. 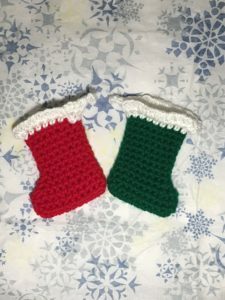 If you sell them please reference me as the designer and where you found the Mini Stocking Ornament Crochet Pattern. 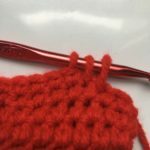 If they would like to crochet the pattern themselves, please refer them back to my here website. 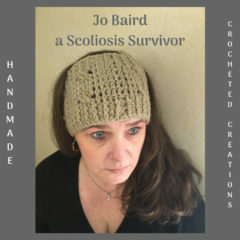 If you would like to purchase ad free pdf versions of any of my patterns, visit my Etsy Shop Items here at my website. 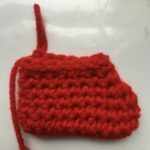 Every purchase of my patterns helps! 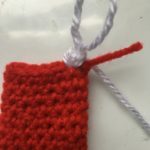 The money earned allows me to buy more yarn so I can create and design more Handmade Crocheted Creations and crochet patterns for you to enjoy. 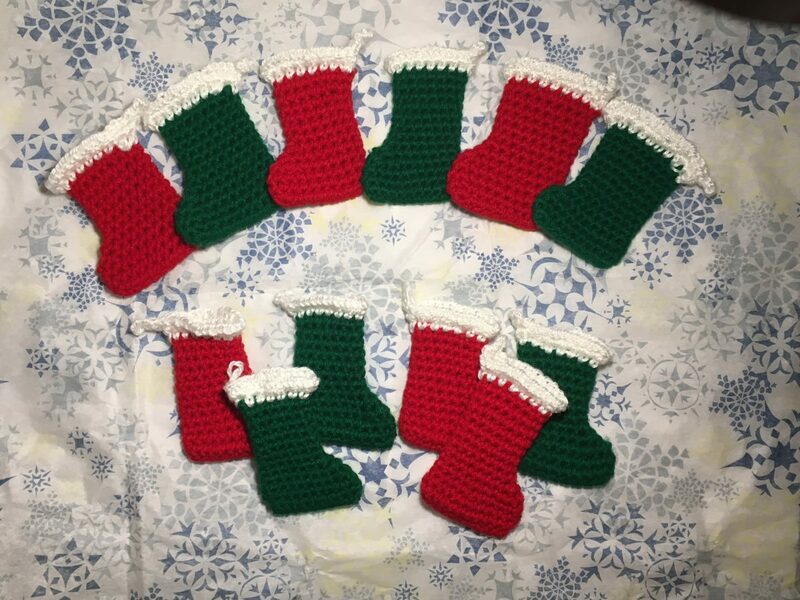 I would LOVE to see your version of my Mini Stocking Ornaments! You can “Hook It” at my Ravelry Jo’s Crafty Hook Designs here. Pictures, Comments, Feedback are ALWAYS welcome below! You can also share them at my Facebook Page Jo’s Crafty Hook Designs here! Would it be ok if I promote your article on FB? It’s really well-written! 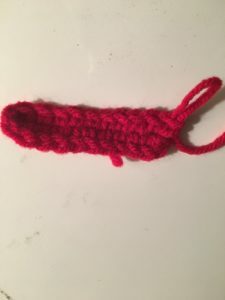 Next Next post: My very first EVER CAL (Crochet-A-Long)!